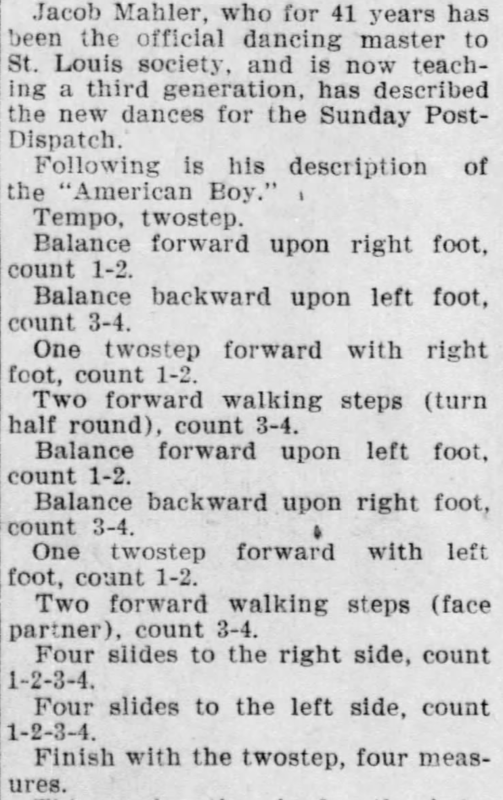 This is an easy American sequence two-step described by Jacob Mahler in 1909. Part I - Balance, Two-Step, and About Face (4 bars): Step forward with outside foot along LOD (1), leaving inside foot behind, then step backward with inside foot against LOD, leaving outside foot in front (3), then two-step forward (5-and-6), step forward with inside foot along LOD (7), and turn 180° toward partner to step back with outside foot (now new inside foot) along LOD (8). Part II - Repeat Opposite (4 bars): Repeat opposite to return to starting point (1, 3, 5-and-6, 7, 8), facing partner at the end. Part III - Four Slides Up and Back (4 bars): Four slide galop along LOD (1-and-2-and-3-and-4), then four slide galop against LOD (5-and-6-and-7-and-8). Part IV - Two-Step (4 bars): Two full turns of turning two-step (1-and-2, 3-and-4, 5-and-6, 7-and-8). No music is specified, so any square, early 20th century two-step will do. Jacob Mahler. (1909, October 24). "Five New Dances Now the Delight of Society." St. Louis Post-Dispatch (St. Louis, MO).